In case you didn’t know, FiveThirtyEight is an awesome blog about statistics. Recently, they posted a challenge against the new Words With Friends Artificial Intelligence. For the sake of science, I decided to replicate their study. 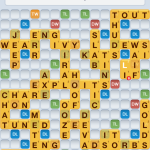 I’m an avid WWF player. As of this writing, I have played exactly 1800 games since October 2010 (which amounts to a little over one game per day). Of those, I’ve won 930, lost 864, and tied 6. Yes, I win more than I lose, but not this isn’t statistically significant (χ² = 2.4281, df = 1, p-value = 0.1192). In other words, I win more than I lose mostly due to chance. I started reading a book about artificial intelligence. It’s an older book, but only $4 and it came highly recommended as a starting point, since a lot of the basic concepts are still the same. Based on the things I was reading and this xkcd, I figured it might be within my capabilities to write a program that plays Tic Tac Toe. And I have. Sort of. You can play it here. Kinda. The Turing Test is a measure of artificial intelligence or, perhaps more accurately, linguistic mimicry. The nature of the test is simple: a judge sits at a computer, and chats (as you would on any instant messenger app) for five minutes. At the end of the five minutes, the judge decides whether their conversational partner was a human or a computer. The bar to achieve a “passing” grade was set by the creator of the test, Alan Turing: a machine fooling 30% of human judges into thinking it was human would pass. In 1950, Turing predicted that the feat would be achieved by the year 2000.